Uncertainty is inherent in estimates of the social cost of carbon (SCC). 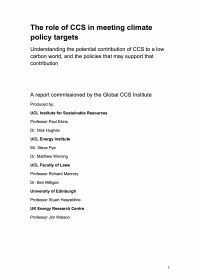 The UK Department for Environment, Food and Rural Affairs (Defra) initiated this research to evaluate the sources of uncertainties, plausible ranges of estimates of the SCC and areas for further research and assessment. The analytical framework for the project is a risk assessment that brings together elements of uncertainty in climate change and its impacts with uncertainties in economic valuation; both are related to the context of decision making.